WAIST HIGH: God Bless You Aamer! T minus 5 days until the premiere of VH-1's Bands Reunited Season Two. T minus 8 days until they tread very sacred ground: In the early 1980s, the English Beat's fusion of punk, reggae and ska quickly made them a UK sensation. But just before embarking on a major US tour, the two lead singers abruptly quit. Without any vocalists, the English Beat would never play again. In 1978, singer Dave Wakeling and guitarist Andy Cox formed the Beat. Soon joining were MC Ranking Roger, bassist David 'Shuffle' Steele, drummer Everett Morton, and a fifty-year-old Jamaican saxophone player known only as Saxa. 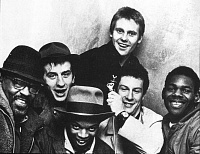 Known in America as the English Beat, the group featured a diverse line-up in terms of age, race, and musical style. Their unique fusion led to a string of hits and tour dates with some of the world's greatest bands. However, the band's members became tired from the road and tired of one another. When Dave Wakeling and Ranking Roger decided to leave the band it splintered into two groups: General Public and Fine Young Cannibals. The six original members of the English Beat have not performed together in over two decades. Tonight we try to get them to reunite. If I did not already say it, God Bless You Aamer Haleem! BR Season Two kicks off Sept. 6 with Haircut 100.